You know when you've had just a little too much coffee? No? I certainly do. And let's just say I may or may not start seeing things on the cups. Well, it looks like I'm not alone. Korean artist Soo Min Kim draws the most insanely detailed and perfectly clever scenes on Starbucks cups and displays them as works of art. Most of them feature the brand's famous mermaid logo and reimagines her within the scenes. These are so good. 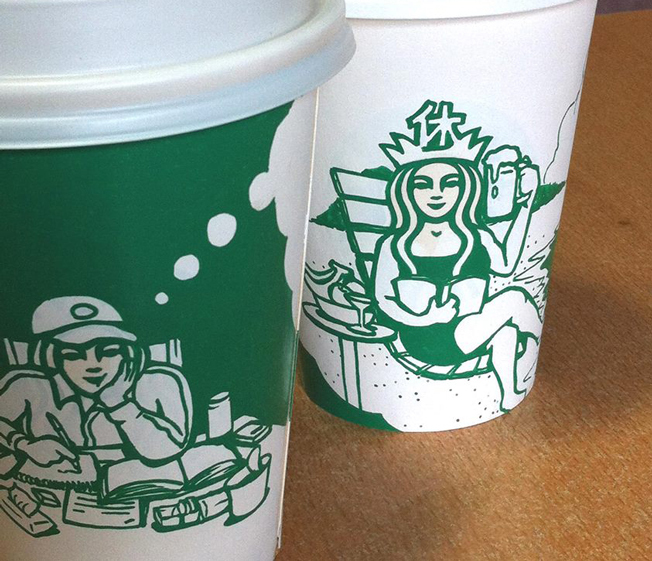 We’ve seen people hack Starbucks cups before, but this guy is downright prolific. Check out his Facebook page for a lot more, and a selection of some of the best ones below. You never give me your coffee. You only give me your funny drawings. Wrestling and/or slow dancing just got a little more fun. Kind of how I feel whenever I log on to Twitter. Orange is the new crack. Fine, I like this one too. Mermaid is the wind beneath my wings. Thomas the Tank Engine on Starbucks is a terrifying premise.